I’m in the ELC (Early Learning Centre). It’s a lovely area for kids. I can see through the window, everybody is busy. Parents are dropping off their children, the students are putting their bag away, putting folder away, taking off jacket and so on. Students look so happy doing activities such as puzzles and construction toys before starting their lesson. This is a little bit different from my school. I’ve got half day for planning and a teacher from other year level will be filling in for me in my classroom. St Leonard’s gives the teachers a whole day for planning and the specialists will take over the lessons on that day. 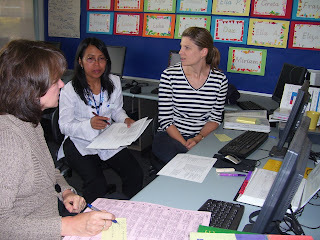 Teachers need to be a thinker when they are planning using the new PYP planner. Well done! Year 2 use the monopoly as an artefact. The children have brought seven different monopolies from different countries such as Germany, Singapore, Holland, Switzerland and Australia. They play and compare it. A lovely activity. I spent most of my time in the secondary building. This morning Kerry Ambrose (Indonesian teacher) picked me up to go to the classroom. 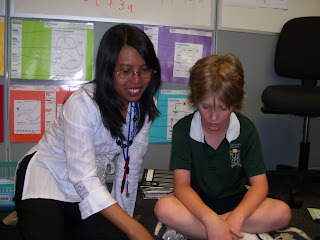 With Ibu Ana, we taught three different classes in year 11 and year 12. 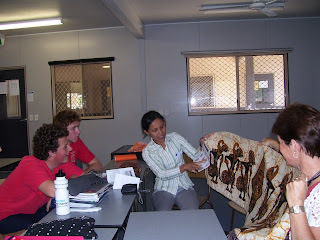 Discuss among student teacher (Mrs Lou) and us about Western lifestyle and Indonesian youth. We did a game about how to recognise friends and silent birthday. There are students who have been risk takers wearing kebaya. It’s lovely because the kebaya is fixed to her body. She pretends to be a Javanese women walking in the traditional ceremony. Later Ibu Ana tells them about ‘WAYANG’ and traditional costume from Jogja. It’s wonderful because she also tells the students about Pandawa. We had a discussion about Indonesia. I am very proud when other people from overseas have learnt about Indonesian culture. Note: We delivered lessons in Indonesian as much as possible. As usual, I arrive at school at 7.45am. I check email and get ready for morning tea. During the first session I visit prep class. They are so cute. (Suddenly I remember my daughters in Indonesia. Oh I miss them). They do writing letters with the first letter ‘i’. As a class teacher, I do some checking and marking, lovely. Next I go to the year 1. They have a maths lesson. Numeration. 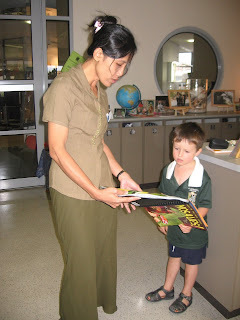 The teacher tries to implement inquiry as much as possible. Maths happens in the classroom. Both the students and teachers are very enthusiastic. They explore the concept of numbers through domino cards. 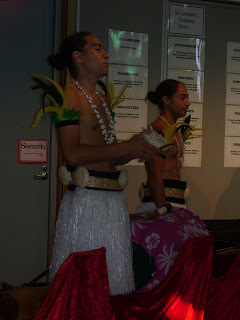 The students went to the Multi-Purpose Room to see a performance by a group of Maori native people. 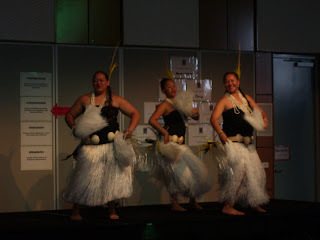 They take the students on a journey through the many Pacific Islands and demonstrate some language and dance. It was wonderful to watch. This afternoon we went with Keith (PYP Coordinator at St Leonard’s) into the city. We go and visit St Paul’s Cathedral opposite Flinders Street Station. This church was very big and very old. It had beautiful furniture inside. I enjoyed seeing this very much. Thank you Keith. Next he took us to buy some souvenirs and to a book shop. We bought some things to take home with us. After school the staff all went to the library to listen to Anne Hammond talk about the new edition of the First Steps Reading and Writing documents. They will help the teachers to assessment and teach to the individual needs of the children. I share what we have been doing about SGJ’s community service. I’m a little bit nervous. In fact, all of the teachers are paying attention to this presentation. This presentation tells the St Leonard’s Primary staff about action beyond the classroom. Today is the best day for me at St Leonard’s College Melbourne. During morning tea, Jane Britten as Head of Junior School led the farewell for us. It will be very sad to leave but we have had a great time. The sun was shining so bright. Ibu Jane and I always come earlier than other teachers. We arrive at school around 7.15. 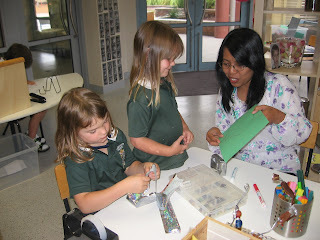 I visited Prep D where Ibu Bernadette teaches. 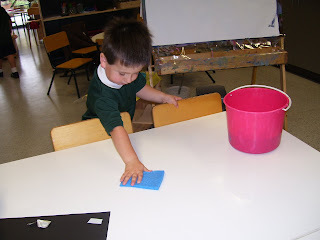 She read a story “The Scrubbing Machine”. The children enjoyed the story. After that she divided the children into 4 groups: writing, reading, drawing and vocabulary – word bank. At 9.30 Ibu Bernadette took the children to the Multipurpose Room to watch a special performance with other students. The performance was provided by the school. It was a wonderful performance. The performers came from Maori backgrounds and they lived in New Zealand. The dancers and singers brought their special instruments to play. Every performance used different costumes. They taught us some Maori words and everybody loved it. It was easy to understand the songs and the movements because they explained it clearly to us before they did each dance. Before the last performance they choose one student and a teacher to try some dance movements using a long stick on the stage (sorry I forget the name of the equipment). The performance took about one and a half hours. Teachers and students looked exited and enthusiastic to watch from the start til the last performance. Wow……. I have had another great opportunity to learn more about another culture. It showed that St Leonard’s is focusing on internationalism and helping their students become more appreciative and be more open minded people and also to respect their own native culture. It is similar to our school; Global Jaya had a special week to learn about other cultures. It can be from our native cultures (Indonesian Culture Week) or it can be from other countries (Cultural Week).During that time each year level does some activities based on the culture that they have chosen. 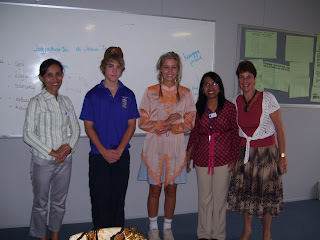 The students learn about the languages, customs, foods, costumes etc. We invite a guest speaker also. Then at the end of activities we have a short Assembly. After school day Endang and I attended on First Steps Reading and Writing PD by Anne Hammond. She gave us some tips on how to record and assess children’s work in reading and writing. Hello…..my name is Anna Yohanna but you can call me Anna. I am one of the year 3 teachers at Sekolah Global Jaya, Indonesia. I have been working at Global Jaya since July 1998. This is a great opportunity for us to join the Teacher Exchange Program and this is the second year of our school involvement in this program. We would like to share something about Indonesia especially our cultures (foods, costumes, beliefs, languages and many things). I brought some special things from Indonesia, such as “blangkon” some kind of traditional hat from Central Java, pictures of the characters in “wayang kulit” (shadow puppet), books about Indonesia and “wayang golek”(another type of puppet from Sundaness -West Java), ‘kebaya ( a traditional blouse for woman) and kain”(some kind of sarong for woman). Endang (my other friend in this program) and I arrived on Friday night after 7 hours on the plane. On that day back at our school they were still doing the second day of Student Led Conference. We met Ibu Jane Lukaitis and Ibu Bernadette around 10 o’clock. 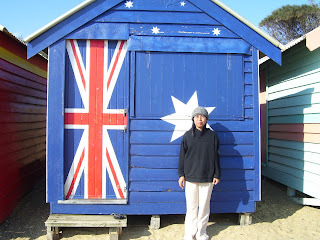 This is the first time we have been to Australia. We keep wondering what the people are doing and why this city is so quite. It is different, totally different to Jakarta where we live. In Jakarta we can see many people and cars on the road. It is always hot in Jakarta especially in the dry season. I am staying at Ibu Jane’s home in Brighton. She has a wonderful family. On the 17th of March, the first day the weather was a little bit cloudy. Ibu Jane took us to Healesville Sanctuary (the weather it was like one of the places in Puncak, Bogor – a close city to Jakarta) and she walked us around Melbourne city too. In Jakarta we have a place that looked similar to Healesville, we call “Taman Mini Indonesia Indah”(Mini Garden of Indonesian) in East Jakarta. There we can see different kinds of traditional houses, native animals, plants, types of Indonesian flower, traditional dance performances, museums and many things. The TMII opens on Tuesday until Sunday (they close on Monday). 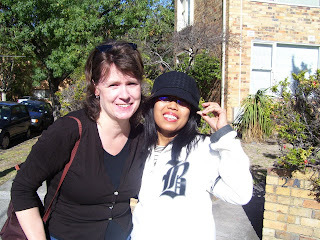 Endang and I were impressed and enthusiastic to know everything about Melbourne. The second day, Sunday morning the sky was bright. It made me feel a lot warmer than yesterday. Ibu Jane took me to Ibu Bernadette’s place. The three of us walked along the beach then we had breakfast on St Kilda Pier. On that day Melbourne had the FINA International Swimming Competition and Grand Prix Race. After we had breakfast Ibu Bernadette took us on her brother in-law’s yacht. I was so lucky because he let us try driving the yacht. It was an unforgettable moment for me. Unfortunately I am afraid on the water and afraid to drive a car but I drove the yacht to the West Gate Bridge. It meant I became more of a risk taker and confident person. I have tried many new things here and I might try something else too. Hai, my name is Endang. I have been teaching at Sekolah Global Jaya, Indonesia for more 10 years. Classes I have taught are year 4, year 5 and year 6. Now, I am a year 5 class teacher. I am so lucky that my school give me chance to go to St Leonard's College in Melbourne. I said to myself, my dream is coming true. Since I departure from The Soekarno-Hatta Aiport Jakarta to the Melbourne, I can't stop thinking and asking myself about everything regarding the teacher exchange program. What do people in St Leonard's College look like? (Form), How does the school work? (Function), How is the St Leonard's College connected to Sekolah Global Jaya? (Connection), What are the points of view of St Leonard's College about "multiculturalism"? (Perspective), What is my responsibility to keep 'friendship' amongst us? (Responsibility) and How do I know that we are in an IB world school?(Reflection). Don't be wondering, as PYP teacher wherever I go, I always keep in mind the key concepts and related questions. Eh...ah! Like a new student, I little bit nervous to go to school. In fact, all of my problem has gone, because all of teachers and staff in St Leonard's are so kind. Thank you for accepting me. After wellcome by Keith and Jane, I get school tour. Keith guide us to go arround ELC (Early Learning Center) and primary building. It is a wonderful school facility. Selanjutnya aku mengunjungi kelas 3. Ada dua kelas paralel.Mereka sedang belajar tentang membaca. Mereka menggunakan metode "Rotation activities". Terlihat sangat menarik. Anak-anak antusias mengikutinya. Selain kelas 3, aku juga ke kelas 4. Kelas 4 juga menyajikan suatu kegiatan yang menarik lewat 'rotation activities' dalam pelajaran Matematika. satu hal yang menarik saya melihat, guru begitu menekankan problem solving bagian dari berpikir matematika. Akhirnya kita sampai di akhir pelajaran yaitu assembly. Mereka menyebutnya mini assembly, yaitu kelompok kelas 1 dan 2 serta kelompok kelas 3 dan 4. Semuanya menyajikan pertunjukan yang bagus. Pada kesempatan kelompok 3 dan 4, kami diberi kesempatan berbagi pengalaman. Pada saat ini pula kami memutar DVD suatu film dokumenter karya kelas 5 Sekolah Global Jaya yang berjudul "Angklung". Video ini dibuat dalam rangka Panasonic Competition tingkat nasional tahun 2006. Murid-murid St Leonard's sangat menikmati video tersebut. The Community of St Leonard's College would like to warmly welcome Anna and Endang. We hope that they enjoy their stay in Melbourne. The staff and students of St Leonard's College look forward to hearing all about Indonesia and Sekolah Global Jaya.